As the war of words between parties intensifies, help us to ensure that all general election candidates recognise the huge value of outdoor recreation in their manifestos and policies. We’ve picked six of the best UK film set walks, so that you can follow in the footsteps of your on-screen heroes and enjoy a cracking hill walk at the same time. Enter our Instagram photo-competition and you could win a climbing session with top climbers and BMC ambassadors Shauna Coxsey, Hazel Findlay, Fran Brown or Molly Thompson-Smith. Jack’s Rake is a popular Grade 1 scramble in the Lake District – but it’s by no means an easy proposition. We look at the skills you’ll need to tackle this classic route. Why pay through the nose to visit the sets of your favourite films when you can stroll right through them for free? Here’s our pick of the UK’s top mountainous movie locations. Do mountain-lovers in the rest of the UK realise how quickly Scotland's wild land is disappearing? With a windfarm the size of Perth possibly about to be built next to the Cairngorms, we spoke to David Gibson, head of the Mountaineering Council of Scotland, about what his organisation is doing to stand up for the mountains. Check out the photos entered into our This Girl Can Instagram competition. Want to start climbing outside this spring, or need to brush up your skills after a long winter on plastic? Get a head start with BMC TV. Keswick Mountain Festival is back for 2015 and giving you the chance to create your ultimate outdoors weekend - outdoor activities, world class speakers, sporting events, plus camping and live music to end after a fun-filled day. Spring is definitely in the air this week, and that's got us looking forward to summer - so our sell-out summer trad tees are back. Pre-order yours from the BMC shop now! 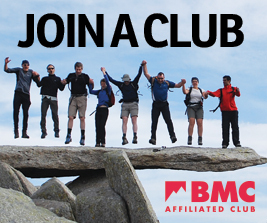 The second BMC Equity Symposium aims to empower people from black, Asian and minority ethnic backgrounds to become outdoor leaders. Book now to take part in this important event based in the Peak District, on 15 to 17 May.